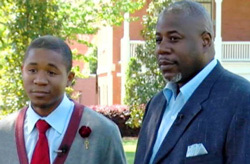 Dorian Joyner Jr., who along with his father Dorian Joyner Sr., graduated on Sunday from Morehouse College in Georgia. Mr. Joyner, 46, was a student at Atlanta’s Morehouse College in 1988 when he decided to take some time off from school to pursue a career opportunity in computers. Over the next 20 years, he worked as a senior analyst in data and finance for several major corporations, including a large law firm. After growing more and more interested in law, he went back to school in 2006 to get an associate’s degree in paralegal studies to make sure he really loved law before investing time and money in law school. In 2010, Joyner Sr. made the decision to do so.